"The Following Takes Place Between 11:06am and 12:00pm"
Hearing those words uttered by the familiar tones of Kiefer Sutherland and then hearing a familiar beeping sound was enough to make me shiver with excitement. This was the indication that 24 was back, something that fans like me had been anticipating since it was announced that Jack Bauer was to return to our screens. It's been four years since we last saw Sutherland's all-action antihero on our TV screens after he became a fugitive from the law. It transpires that in that time Jack has been able to keep a low profile thanks to his ability to evade the eye of the various agencies that were tracking him. However, the pre-credits sequence in this episode show that the CIA have tracked him down in London and this thrilling opening scene sees Bauer's initial arrest. Although the entire series is set in London you wouldn't know it for the majority of episode one as every character is American. Indeed it's the CIA's London Base to which Jack is sent for interrogation initially at the hands of Agent Steve Navarro (Benjamin Bratt). However the CIA are instructed to hand him over a special activities group who will use all forms of torture to extract the truth from Jack. Disgraced CIA Agent Kate Morgan (Yvonne Strahovski) is the only one who realises that Jack was captured all too easily and wonders what he's really doing there. Unfortunately, Kate is on her way out of the door as she due to be transferred after it was revealed her husband had been selling secrets to the Chinese. Predictably Kate is proven to be right after Jack fights his way through Special Activities in order to save his former right hand woman Chloe O'Brian (Mary Lynn Rajskub). It soon transpires that Chloe has been similarly on the outs with society since letting Jack go at the end of the final series. She's since become a goth-like computer hacker whose been operating with a crew in London headed by the charismatic Adrian Cross (Michael Wincott). Jack's true mission is revealed when he infiltrates Chloe's group in order to find one of their former members Derek Yates (Joseph Millson), who is involved with a plot to assassinate President Heller (William Devane). It appears as if Jack's motivation for completing the mission are to repay Heller and his daughter Audrey (Kim Raver) for the hurt he caused them in the past. Part of me also wondered if Jack feels that he'll able to win back Audrey if he successfully stops Yates but that'll be hard seeing as she's now married and all. Add to that the fact that Audrey's husband Mark (Tate Donovan) is already trying to have Jack shipped over to Russia. As is always the case in 24, there is a political subplot this time involving the fact that Heller is in the early onset stages of dementia. William Devane does a good job of subtly portraying Heller's dementia as he misses out the odd fact or forgets certain details. Mark, who is also Heller's chief of staff, feels that any mention of Bauer will only hurt his boss and his wife. Mark in fact was the man who helped Audrey through therapy and believes that seeing Jack can only have dire consequences. Heller is primarily in London to discuss the issue of using drones with the Prime Minister (brilliantly portrayed by Stephen Fry). However things soon become complicated when a drone ends up wiping out four soldiers in Afghanistan, including two Brits. Although Yates is the man behind this attack the blame is laid at the door of soldier Chris Tanner (John Boyega) who was at odds with his commanding officer during the time of the drone strike. 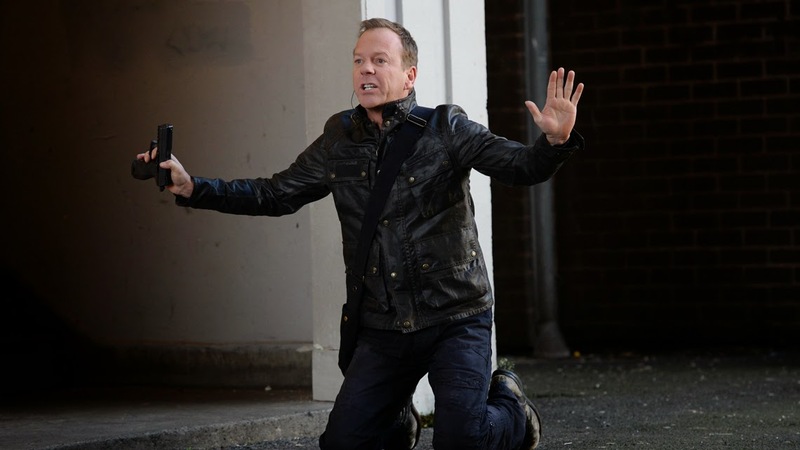 In another narrative device which will be familiar to fans of 24, Yates is revealed to be only a small cog in a bigger wheel. He is in fact working for a lady named Margot (Michelle Fairley) who wishes to ignite a full scale political conflict by finishing off Heller on British soil with an American drone. Although this story seems awfully convoluted to 24 novices, I feel that it sounds as plausible as anything the series has previously offered. One thing I did notice about the narrative in the two opening instalments was that everything appeared to be moving a lot quicker which can be attributed to the reduction of episodes in this series. One of my main gripes with past 24 series has been the fact that they start to lag in the latter stages and it seems that having only twelve episodes means that each instalment is more tensely paced. I think the writers have done a good job of introducing all the new characters even though they all seem incredibly familiar to regular viewers of 24. There's the boss who likes to play be the rules, the renegade female officer who likes to break them, the wary chief-of-staff to the President and the criminal mastermind who will inevitably meet their demise towards the end of the series. 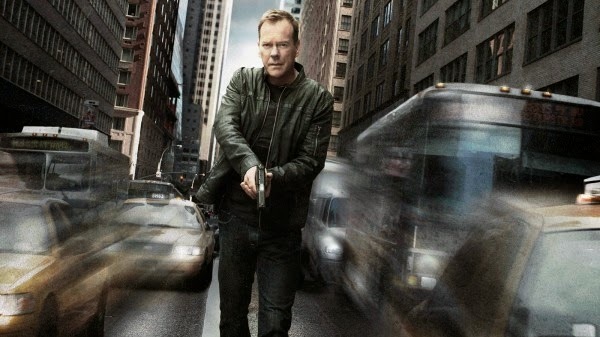 At the heart of 24 though is Jack Bauer and I thought the initial reveal of him as the terror suspect was brilliantly done. The fact that he appeared on a big screen in the CIA headquarters really added some symmetry to the series as he was last seen on a screen at CTU. In addition I think it was great that we didn't hear him speak until the second half of episode one as it really built up the tension and made the audience question why he was really there. I'm glad that Chloe has also been brought back and I'm looking forward to finding out more about what's happened to her in the last four years. In terms of the thriller element of the show, I thought 24: Live Another Day certainly lived up to the action sequences of previous series. From Jack's opening arrest to the fight through an Ealing Tower Block and the first major murder of the series, the programme really kept me on the edge of my seat. 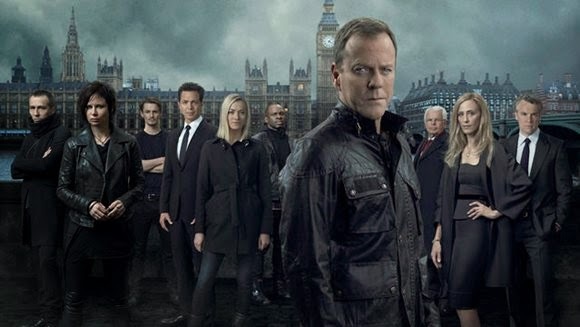 Obviously, like with all series of 24, you have to suspend disbelief in order to enjoy the ride but I don't find that hard to do when Jack Bauer is in charge of the ship. British viewers may have a problem with the Americanised version of some of the stock characters, in particular the nerdy computer hackers and dodgy looking drug dealers, but I think they all add to the overall fun of the show. Judging from these first two episodes, 24: Live Another Day is definitely an attempt to bring the franchise back to its former glory. 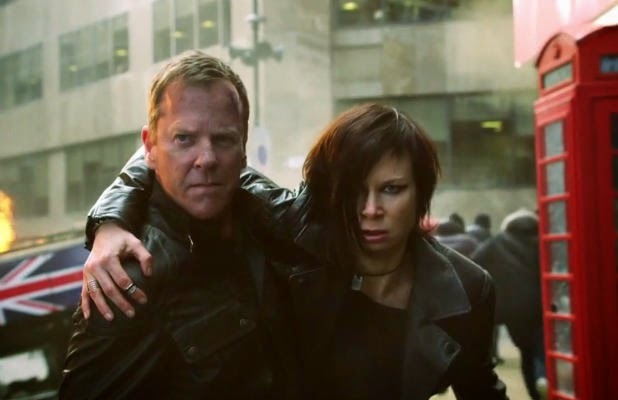 Although the last series of 24 had its moments it didn't live up to the programme's glory days and, judging from what Kiefer Sutherland has said, Live Another Day is going to provide a fitting ending for the show. As a fan of the programme I may be a little biased but I definitely feel as if these first two episodes provided plenty of thrills, shocks and classic 24 moments to satisfy fans and newbies alike. I'm no just crossing my fingers in anticipation of an action sequence involving Jack Bauer and Prime Minister Stephen Fry.